My first stop upon arriving along the Middle Division of the old Pennsy was here, at Hunt Tower in Huntingdon, PA. Arnold Mooney deserves credit for recommending this location to me for use in instances such as tonights. After driving six or more hours over from Phillipsburg, NJ, I was happy just to watch a few NS freights going by. Fifteen minutes had not passed before a white pickup pulled up with an NS maint. foreman at the wheel, warning me to leave before the NS cop shows up to fine me! You know............getting fined by the railroad you want to shoot could really cut into the vacation fund! So I left to find a campground to set up in, but............. no one said I could not take night photos there. Certainly not the maint. of way foreman, although I "may have been" guilty of not bringing the subject up with him at the time. So the location was marked, it was too good to ignore at night. Little did I know at the time it would be more than a month before I had the opportunity to capture a Heritage unit passing the tower! LOL! For the first couple of weeks the Heritage units operating in this area were either running at night only over the Port Road branch between Enola Yard and the Northeast Corridor or were trailing in the locomotive consist. Tonight however, success is within reach. 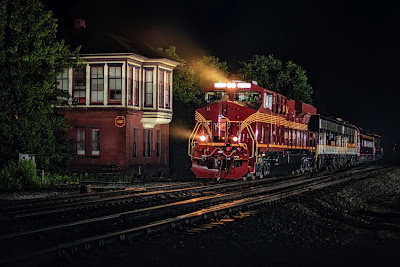 Having been tipped off earlier by Sean Hoyden of the Pennsy Heritage engine going to the Strasburg Railroad Museum accompanied by NS F’s and business cars to help in celebrating the 30th anniversary of NS, we both concluded it looked promising for the 8102 to lead returning back to Altoona Sunday night. Nothing is a sure thing on NS however, as I had discovered earlier in the trip when the Interstate unit, after sitting for a day or more in Roanoke on a loaded coal train bound for Newport News, was pulled off the train after the new crew was called and reassigned to a southbound loaded coal train bound for Georgia! Tonight, accompanied by favorite conditions for night photos, off and on showers, I am content to have done the best I can under the circumstances, the photo is either going to happen or not. Once set up, I have a steady parade of westbounds to shoot racing past the tower. I consider them practice shots! LOL! Train speed here I would guess to be between fifty and sixty mph............real fast! It was just before three a.m. when I returned to the car to pour another cup of tea................and the magic began. A bell somewhere in Huntingdon sounded three times, announcing three a.m. The car scanner comes to life picking up another approaching westbound two detectors away from me! I jump out of the car and reposition the step ladder along the florescent red painted line on the ground, double check my manual focus on the lens barrel, then climb atop the stepladder. The westbound hits the nearest detector, I hear train 381, it means nothing to me. NS, further endearing itself to me, does not require their crews to identify the lead unit, only the train number when referring to their train. A test shot looks good, then with the train less than a mile away, closing fast, for a few seconds I hear the unmistakable sound of non-turbocharged 567 prime movers working. I break out into a big smile, only the F-units would be out here tonight with 567s! The conductor calling the clear signal at Hunt westbound comes over the scanner, the crossing gates go down, leaving me with one final question to answer...........is the 8102 still leading? The evidence is seen quickly as the cab of NS 8102 negotiates the curves leading up to the grade crossing! The “bright as headlights” number boards give its presence away! I hear the engineer throttle back and think to myself..........oh yes! Then watch the pilot plow up to my mark, and the light flashes out to illuminate the scene! Then the cab is past me before I can raise my hand to wave! LOL! The image, proof of the moment, is there glowing on the back of the camera. Oh my god! After shooting black and white diesels all night...........what a beautiful paint scheme! The massive GE dwarfs the trailing NS F-units! And Hunt Tower provides the perfect backdrop. Special thanks to Sean Hoyden and Arnold Mooney for their help in obtaining this night photo. Shot in Huntingdon, PA. on June 04, 2012 at 03:03 with the 5D and Mamiya 645 format 80/1.9 lens. Please enjoy! Comments are welcomed. The first Heritage locomotive I crossed paths with on this trip was, surprisingly, on the Delaware Lackawanna here, east of Scranton, PA at Moscow! 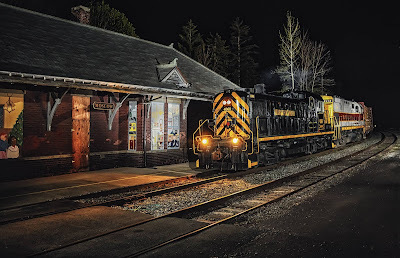 Earlier this year Michael Thomas had invited me down to shoot the partly nocturnal Portland Turn which runs out to East Stroudsburg from Scranton, returning in darkness near Scranton. I emailed Michael about my upcoming trip and how I would look up the job tonight while I was passing through. So here I am, at nine pm, first night out, having slept a few hours in a nearby State Park, set up and waiting trackside in Moscow, contemplating the locomotives I will get to shoot on this job. Reminding myself how this would be a first for me, to shoot an ALCO under the lights at night. LOL! I was prepared for a four or six axle Century. It never entered my mind that they would lead with one of their trio of RS-3s! Nine thirty passes, and aware the crew outlaws at eleven, I’m wondering if I missed them. Just before ten pm I am relieved to hear train sounds, real ones, not created by my mind, as flanges squeal and a rail or two groans off upgrade to the east. Then headlights through the trees and the faint sound of idling ALCO prime movers. The head end rolls slowly around the curve, the engineer gives me a couple of toots, and I focus on the ditch lights as the pilot plow drifts up to my spot. In the pitch dark I had no clue of the presence before me of an as-built ALCO RS-3. When the lighting went off I glimpsed it, and watching the image appear on the camera lcd monitor left me speechless! By this time 4068s cab is passing across from me and I wave into the darkness. The crew didn’t really need to see me, they have seen the expression I was wearing on the face of many ALCO fans they have run by in the past! LOL! At night, not knowing what is coming, the impact of the moment is tremendous! The crew stopped below me to set out several lumber loads, backing up to where I was, next to the stepladder. I mumbled a thank you to the conductor, who climbed down off the car and set the hand brake before walking up to the next car. I thought I knew the heritage of 4068, as being an original Delaware & Hudson RS-3, but..............in checking on the net for this photos caption, I am overjoyed to realize 4068 also spent time working in Vermont as Lamoille Valley 7801! My favorite among the Lamoille Valley RS-3s for retaining its high short hood, I had lost track of the engine after it was bought by the York-Durham Railroad up in Ontario. Who would have thought we would cross paths again in the future................in 2012? What a way to begin this trip! 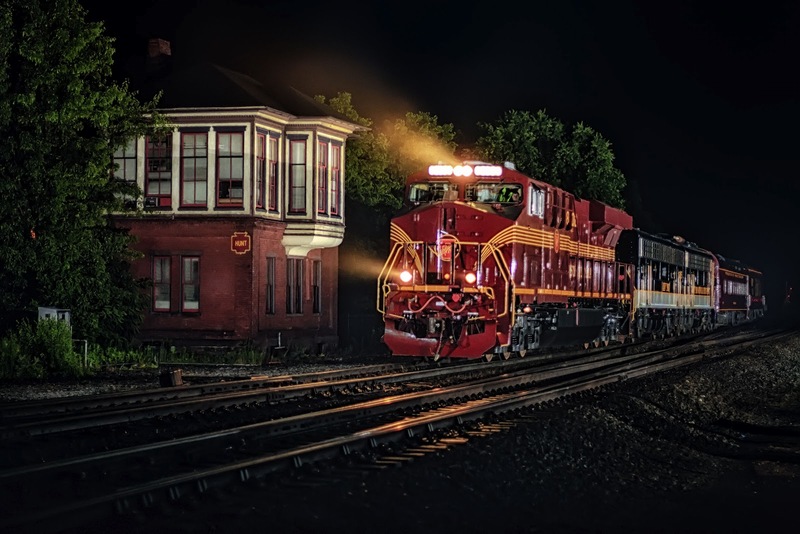 Shot in Moscow, PA on May 1, 2012 at 22:04 with special thanks to Michael Thomas! Please enjoy! Comments are welcomed.